One of the most enjoyable things about training with positive reinforcement is that as soon as the dogs sense that a training session is about to start, a kind of buzz happens. They can be fast asleep or lolling about in the sun, or just sitting gazing out at the garden, but as soon as they hear me getting my gear together (and they hear it – no matter how quiet I am), all of them are standing at the door, tails wagging and eyes bright. This is because they just love training – training is not a chore it is a game we play together. It gives them an opportunity to have a conversation with their trainer, to problem solve, to earn reinforcement. Using positive reinforcement with a bridging stimulus has another advantage. It gives the dog freedom to experiment with behaviours. This is a trait that is not present in any dog that shows signs of Behavioural Inhibition. There is nothing sadder than a dog that is so anxious about doing the wrong thing that it ends up doing as little as possible. It becomes so inhibited that teaching it anything outside its experience is really difficult and time-consuming. Some features of a behaviourally inhibited or shut-down dog would be a resistance to trying anything new or foreign to its experience. A 14 week old puppy that has been positively trained from the get-go will have absolutely no problem rapidly offering behaviours such as climbing on to a raised object, offering position changes voluntarily, readily taking food rewards, making eye contact and so on. The inhibited dog will, on the other hand, even when lured on to a raised object, will, after many, many sessions be very hesitant to try it and will often start the session simply sitting or standing and doing as little as possible. This same dog will take many, many sessions of luring the down before offering the position, and even then will lower itself cautiously without making eye contact as though not sure what the consequences will be. It is possible to make things better for these sad little dogs. Identify the situation that tends to activate behavioural inhibition and avoid that situation. Change the environment. If the dog is unhappy in the area that you train, move somewhere else where the dog is more comfortable. Identify anything that the dog will participate in willingly. And gradually use this participation to ease the dog into working more confidently towards goals that you have set. Observe the dog closely and avoid anything that causes the dog to shut down. Once the dog becomes more confident these things can gradually be reintroduced. Exercise LOTS of patience. Even a hint of frustration or irritation will lead to a shut-down dog. End the session immediately you start becoming frustrated. Trust in your relationship with your dogs is a fairly complex construct. It does not simply “happen” but must be built and added to one positive interaction at a time. In this way we are continually making deposits into the trust account in much the same way as we make deposits into a bank account. We also make withdrawals from this trust account with negative interactions such as force, punishment and threats, and with each negative interaction the balance in our account is reduced until the account is overdrawn resulting in a “bankrupt” relationship. We know that there are basically two ways to teach a dog to sit. The one way is to provide positive reinforcement every time the dog sits by either giving him a treat or throwing a ball (remembering that it is the dog that decides whether the reinforcer is desirable or not). Every such positive interaction with your dog would result in a deposit into the trust account. The other way is to train the behaviour with negative reinforcement by applying force in the form of an aversive. Pushing down on the dog’s rear end until he sits is a form of negative reinforcement. The dog sits down to avoid the pressure of your hand on his rear end. This would be a withdrawal from the trust account. The other way to make deposits into your trust account is to give your dog control thus providing the opportunity to have choices, make decisions, take action and in so doing learn from the consequences of his actions. Very often if the dog comes when he is called, he is immediately grabbed and leashed thus taking away all control from him to choose to stay with you in order to be positively reinforced. Each time you grab and leash you take the control away from him and also make withdrawals from the trust account. Allowing your dog to make these choices will result in huge deposits in your trust account. Of course, goes without saying that if you fail to reinforce the right choices no learning will take place and you will be back to grabbing and leashing. I’ve been keeping a mental “cash book” of my Trust Account with my dogs and have been more and more aware that even though the withdrawals are tiny, they add up very fast, eating away at the balance that has been built up over time. It’s made me realise also that the best way to get rid of an undesirable behaviour is to train an incompatible behaviour using positive reinforcement. So instead of punishing the undesirable behaviour and bankrupting my trust account I’m actually making more and more deposits, and at the same time getting rid of the undesirable behaviour. It’s a win-win situation. In behavioural terms, extinction is the lack of any consequence following a behaviour. When a behaviour is inconsequential (i.e., producing neither favourable nor unfavourable consequences) it will occur with less frequency. When a previously reinforced behaviour is no longer reinforced with either positive or negative reinforcement, it leads to a decline in that behaviour. In other words, if your dog has been reinforced for a behaviour, and that reinforcement is removed, the behaviour will eventually decline or extinguish. Reinforcement does not necessarily always come from you but often comes from the environment. For example, if your do g jumps on the kitchen counter top and finds food there, then jumping on the counter top behaviour will happen again. Every time this behaviour leads to reinforcement it will become stronger. You did not play an active part in this scenario. 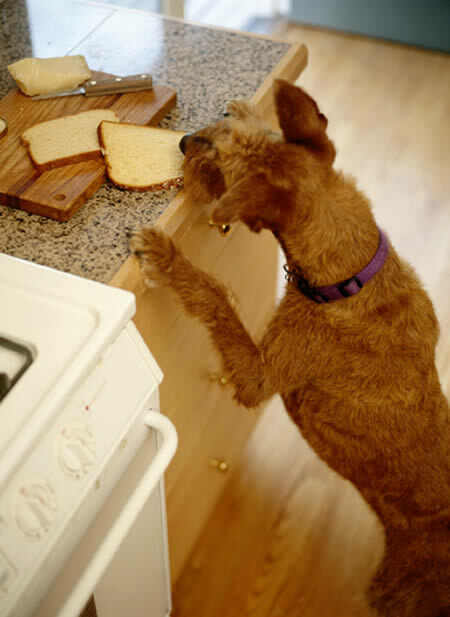 “Catching the dog in the act” and punishing it will only result in the dog being more careful to indulge in this “counter surfing” when you (the punisher) are not present. What will work in this case is to remove the reinforcement (food on the counter). If the counter NEVER provides food for the counter surfer, the behaviour will extinguish. Bear in mind, however, if a behaviour is either self-rewarding or rewarded by the environment, extinction will fail unless the trainer can consistently offer a better reward. Barking is frequently a self-rewarded behaviour. Waiting for a dog barking at passers-by to simply get bored from “lack of reinforcement” is an exercise in futility. When dealing with self-rewarding or environmentally-rewarded behaviours, a combination of management, positive reinforcement, and negative punishment is an alternative solution. Just before behaviour extinguishes it undergoes an “extinction burst”. This means that the behaviour will become more and more intense just before it goes away. If your dog barks incessantly to be let in and you decide to use extinction as a way of stopping the behaviour, be prepared for it to increase in intensity, duration and volume just before it extinguishes. If you open the door at this point, you have reinforced the behaviour at its worst and this is what you will get next time. The only way to deal with this is to carry on ignoring it. Fit ear plugs, retreat to the furthest part of the house, and warn your neighbours. Savvy trainers use this extinction burst as a tool when raising criteria in certain behaviours. For example, say we are working on latency (speed) of the sit. We ignore all the slow sits and only reward the fastest sits. What will happen is that in response to the absence of reinforcement the sits will become faster as the dog’s sitting behaviour starts to undergo an extinction burst. Because these more intense sits are the only ones that are being reinforced, the slower sits will extinguish and the better ones will increase.